Cassini images of Titan's south polar region taken in 2005 (right top and bottom) show dark areas that were not present in the 2004 images (left top and bottom) represent lakes. During the year that elapsed between the images, clouds (bright features) frequently appeared and suggest methane rain could be responsible for the new lake features. It's beenraining liquid methane on Titan. That's according to an analysis ofjust-released images revealing a possible new lake in the south polar region ofSaturn's largest moon. Measuringabout 3,200 miles (5,150 kilometers) across, Titan is larger than the planetMercury and about 40 percent the diameter of Earth. It is the only moon in thesolar system with a dense, planet-like atmosphere (10 times denser thanEarth's). Thepossible new lake showed up in images taken in 2005 by the Cassini spacecraft's Imaging ScienceSubsystem (ISS). Cassini's photos taken in 2004 of that same region didn't showsuch a dark spot. Scientiststhink the most plausible explanation for the sudden appearance is a lake filledby recent rainfall. Thisconclusion, detailed in the Jan. 29 issue of the journal GeophysicalResearch Letters, confirms the thinking of various Cassini scientists whohave suspected the presence of such lakes onTitan, aswell as methane rain. The newanalysis, by Elizabeth Turtle, Cassini imaging team associate at the JohnsHopkins University Applied Physics Lab in Laurel, Md., and her colleagues, providesmore evidence for the link between methane rain and the springing up of a lakeon the surface of Titan. Turtle'steam noted a possible source for the rainfall ? 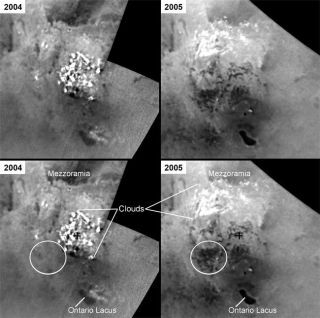 a team using the KeckObservatory spotted a large outburst of clouds over Titan's south pole inOctober 2004. Cassini images also show cloud systems above the south polarregion during that intervening year. "Theclouds, when we look at them over a period of a few hours, behave likeconvective clouds, the same way you have thunderstorms on Earth," Turtletold SPACE.com. "If you watch them over a few hours, they kind ofbillow upwards the same way thunderheads do on Earth." She addedthat the dark features "could be the result of a downpour from this bigsystem of clouds that was seen in October." Turtle'steam also examined more recent Cassini images taken in 2008 of Titan's northernlatitudes, sections of which had not been imaged with the ISS until now.Comparisons of the south-pole images with those of the north pole confirmedgreater stores of liquid methane in the northern hemisphere compared with thesouthern hemisphere, Turtle said. Thoseliquid stores at the north pole could grow as summer arrives at the northernhemisphere and storm clouds dump liquid hydrocarbons onto the area. Some of theknown north polar lakes are large. If full, Kraken Mare, with an area of154,000 square miles (400,000 square kilometers) would be almost five times thesize of North America's Lake Superior. Together, the lake areas in the northernregion observed with Cassini's ISS cover more than 197,000 square miles(510,000 square kilometers), an area that is nearly 40 percent larger thanEarth's Caspian Sea. Oneremaining question is whether such lakes could resupply Titan's atmosphere withhydrocarbons over geological time scales. Over time, chemical reactions inTitan's atmosphere destroy the hydrocarbons. "Ournew map provides more coverage of Titan's poles, but even if all of thefeatures we see there were filled with liquid methane, there's still not enoughto sustain the atmosphere for more than 10 million years," Turtle said. Combinedwith previous analyses, the new observations suggest that underground methanereservoirs must exist. Funding forthe Cassini program is set to end Sept. 30, 2010, though scientists say thespacecraft could continue to return valuable data and images for years to come.Next month, Cassini mission officials are expected to present their case toNASA headquarters for a seven-yearextensionand associated funding.